This was one of the first fajas that I did with Rosa. It was a challenge to communicate my idea. I was still learning Spanish, and would try to tell Hilaria what Rosa needed to know in terms of the weaving. Hilaria would then communicate this to Rosa in Totanaca. My initial thought was to try to have all of the logos woven into the faja. I was thinking of DNA strands and the seemingly ancient pattern created by backstrap weaving. Since genetically modified technology alters the strands of DNA, I was wondering how a "contaminated faja" might be altered in its weaving technology. This created incredibly complicated and time consuming weaving for Rosa. Ultimately, we decided to have Hilaria embroider the logo. 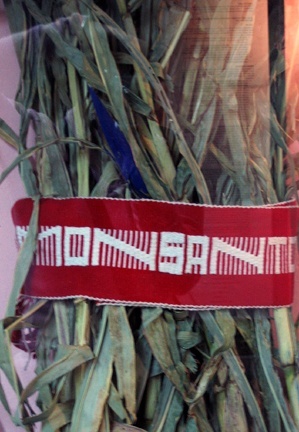 Monsanto, of course, is the big daddy of biotech agriculture. Since I don't have the funds to defend myself from lawsuits, I'll just encourage you to do some light reading.